Hallelujah It’s Friday (HIF)! The weekend stretches before us and we’re both up to our eyeballs in house projects. 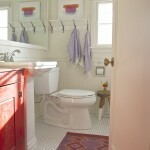 As fun as spackling holes and painting ceilings is, sometimes it’s a nice boost to look for inspiration – to dream of the day when a room is complete enough to hang new art in, put down a rug, or set out a pretty vase of flowers. 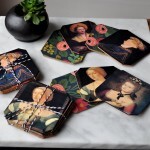 We both love finding inspiration and unique treasures on Etsy, so we thought we’d round up a few of our favorite Etsy items and sellers so you can see them too. Thanks for joining us! 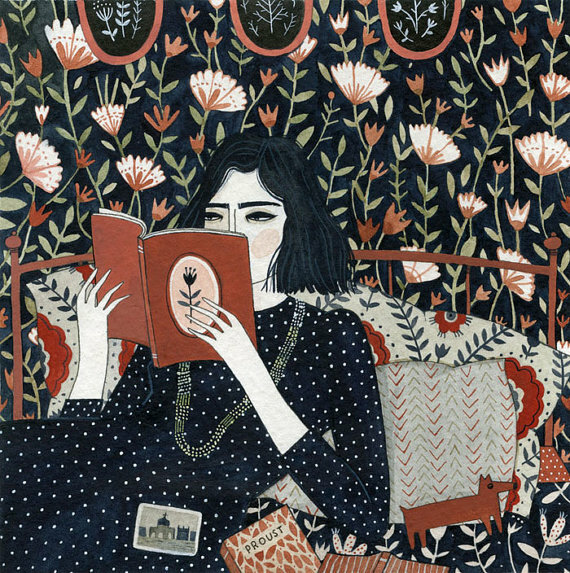 I love the quirky art of Etsy seller Yelena Bryksenkova. 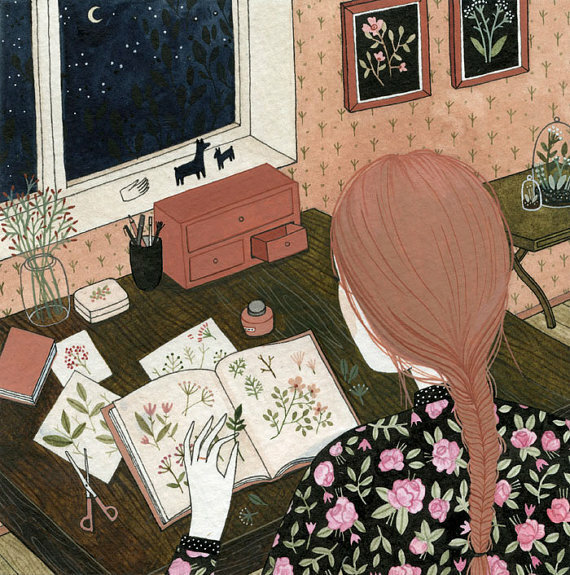 I’m especially drawn to her magical prints of interiors; detail-rich rooms I’d love to visit that are filled with gorgeous patterns, cozy scenes and the occasional sleeping cat. 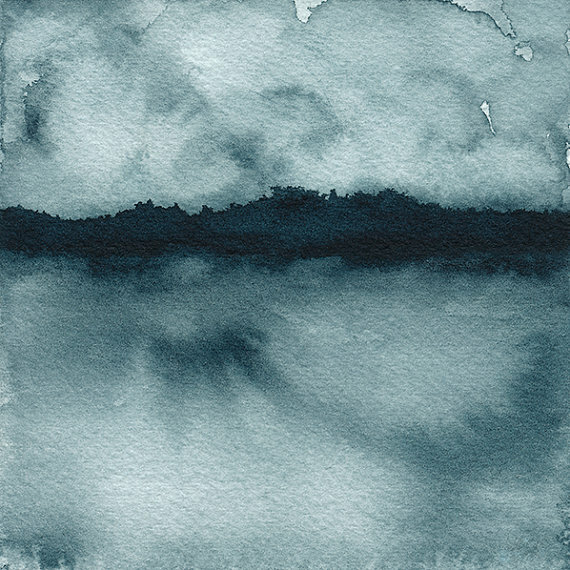 I also love these petite indigo watercolors by Renee Anne. 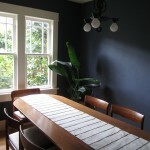 They’re sweet and simple and might be just the little monochrome moment my blue walls need. I love the creepy glamor of this print by Julienne Jattiot. I don’t read a word of German, but my guess is that this did not end well for Leda (and I apologize if this actually says something totally heinous and offensive; I know ignorance is no defense but my defense is ignorance). It’s pretty hard for me to resist an irreverent cross stitch, and plus my daughter’s initials are OG so doesn’t that make me the O OG? Yeah, it does feel good. 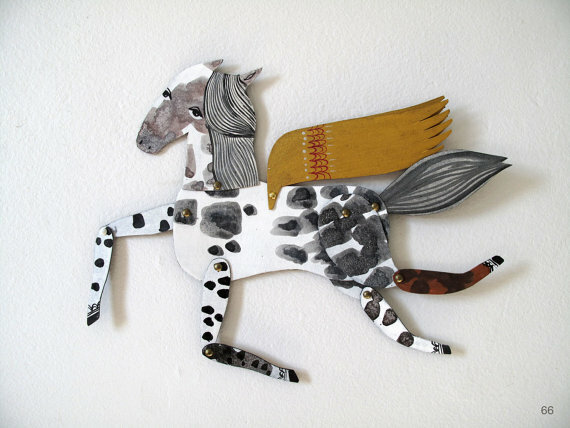 I actually own an articulated paper horse from artist Emma Kidd’s Hinged Beasts series and I would love to have a herd. The one I have is magical and dreamy, with such a cool winged-fantasy paper-doll feel but with all grown-up artistry. I wish this appaloosa would trot right up to my door. Have a terrific weekend! 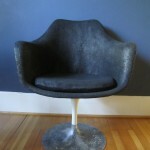 Check back in on Monday for the next stage of Katie’s living room redo! Fun Etsy finds Mera and Katie! As always, many thanks for sharing and HIF! I always learn such interesting things from you two. I just love the artist who paints those interiors, (never heard of her before), and think that flying horse is so charming. Thanks! 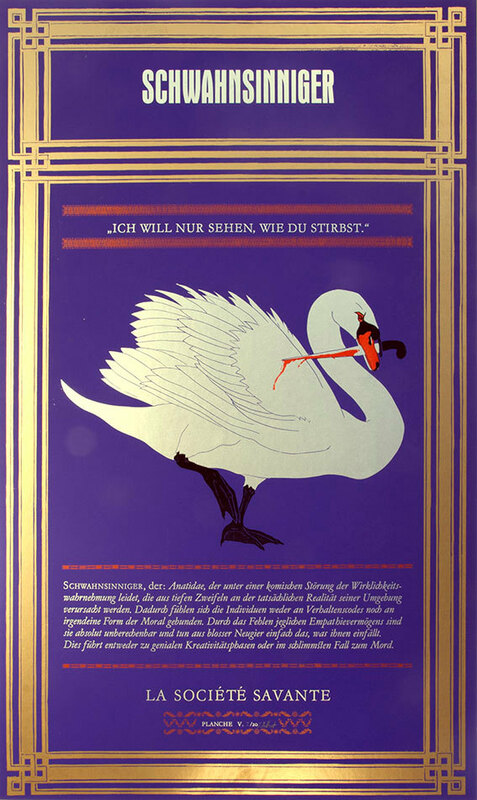 I can’t read the italic print in the swan poster, but what I can read translates: “I just want to see you die.” Cheery! I love this feature (is it a regular Friday one?) Thanks for introducing me to the artist Rene Anne. 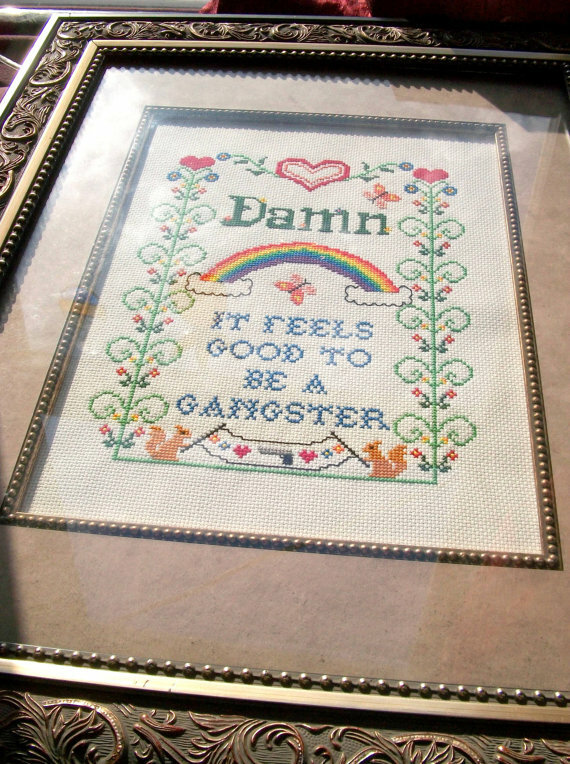 And that gangster needlepoint is pretty awesome. Happy Friday! 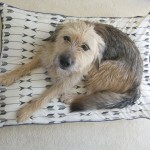 I just want to see you blog! 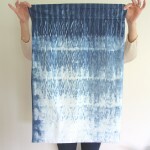 Yep, Etsy round-ups will be a regular Friday feature – so glad you like it! What a great selection. I’ve actually got an Etsy voucher sitting in my account, since November. I’ve been waiting to move into a permanent home to spend it. Now I’m in my own home, I need to find some free time to peruse and see what takes my fancy. My 7 year old son is obsessed with horses so he would love me to buy the articulated horse you featured.